This classic family film was helmed by Jim Henson and was completely in on the joke of what kind of movie they were making. 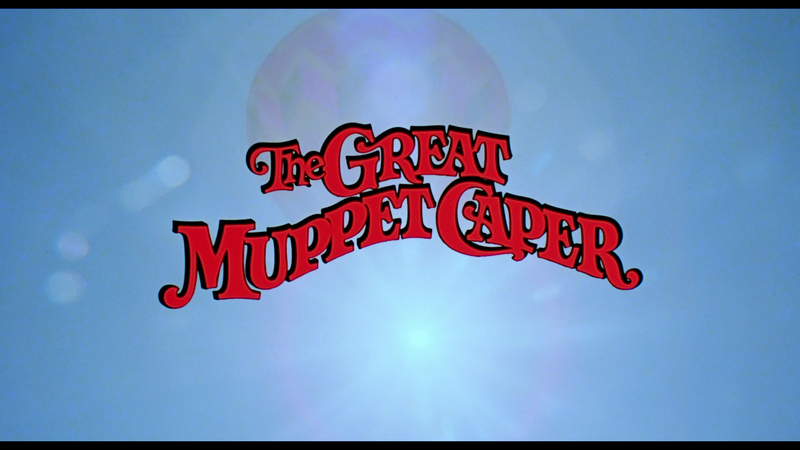 As the movie begins, Kermit, Fonzie and Gonzo are in a hot air balloon and acknowledge that they’re up there to display the opening credits; it’s a cut nod before it was cool to break the fourth wall. Outside of the opening, the rest of movie is just as fun. 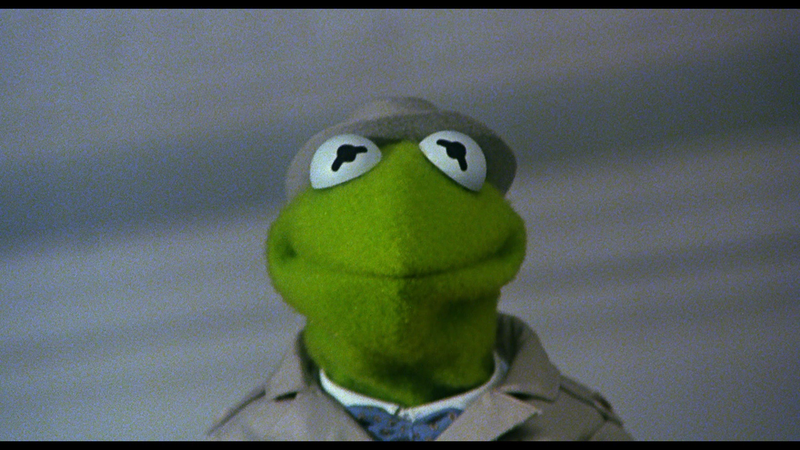 Much like Muppet Christmas Carol, we have our favorite Muppets filling out roles like Kermit as an investigative reporter, Gonzo a photographer, etc and going to a rundown, cheap motel where they meet other electic characters from the Muppet universe. This isn’t my favorite Muppet movie, but the jokes mostly land and there’s a couple catchy tunes. This entry isn’t as tongue-in-cheek but has the same magic as other Muppet movies. Now we get Kermit and company playing pirates or crewmen going after lost treasure. This go-around we get a fun performance from Tim Curry who is always delightful and plays it to the hilt. 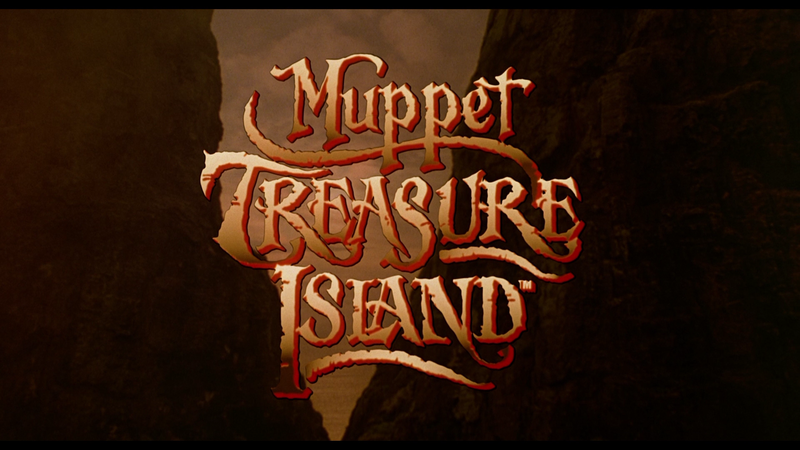 Continuing the semi-tradition, Muppet Treasure Island was directed by Brian Henson and it’s fairly well done, though I question the G-rating considering it is about pirates and can be a bit dark in tone. This release comes with a glossy and embossed slip cover. Inside are two DVD Copies for each movie. Frog-E-Oke (2:08; HD) – With this you can sing along to the song, “Cabin Fever”. The Tale of the Story Behind the Tail (21:40; SD) is a classic BTS featurette with vintage interviews. 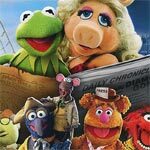 Audio Commentary – Director Brian Henson is joined by Gonzo and Rizzo as the trio chat up about the movie, though it’s mostly Henson who does provide some interesting bits of info before Gonzo and Rizzo jumps in with some quips rather than commentary. 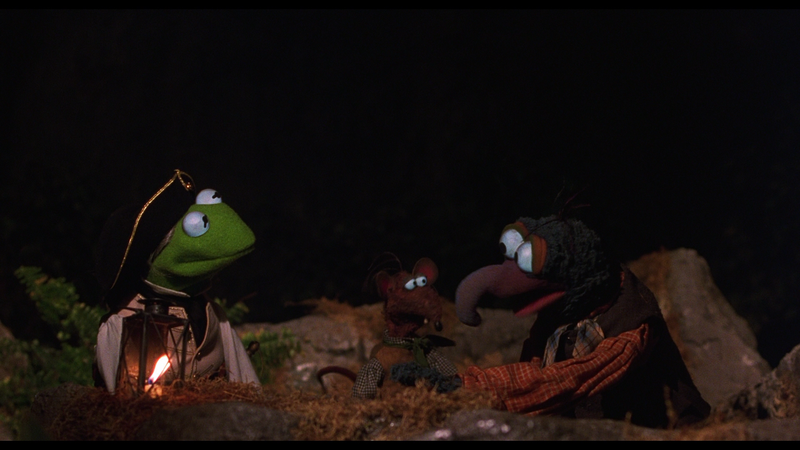 Both The Great Muppet Caper and Muppet Treasure Island make their debuts on Blu-ray both presented in their original 1.85 widescreen aspect ratio and a remastered 1080p high-definition. One can understand I was a bit skeptical before checking this release given that crap job Disney had done on a couple of the animated releases, but I was pleasantly surprised to find both movies look really good and it doesn’t appear major DNR was done. Detail levels look quite nice and outside of a few scenes in Caper, which appears a bit splotchy, I thought both transfers were well done. Colors appear to be well balanced with Treasure Island moving more towards natural tones while Caper is brighter. Unlike the half-assed releases of Winnie the Pooh and Mickey’s Christmas Carol, both of these received upgraded audio in the form of DTS-HD Master 5.0 tracks. Neither is particularly expansive but nonetheless a solid uptick from the original DVD releases. Dialogue levels especially benefit while ambient noises are relegated to the front and rear channels, though with Caper, it’s a bit more front-heavy. 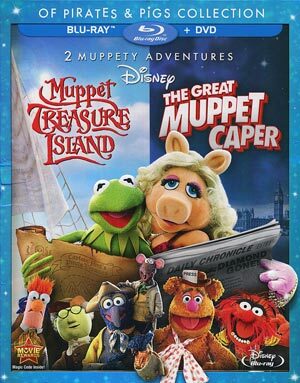 Overall, this is a release you buy solely for the movies and both The Great Muppet Caper and Muppet Treasure Island are great movies for the entire family, though latter is a tad darker in comparison. However, the bonus material is limited (and mostly non-existent with Caper) but the audio and video transfers are both well done and don’t appear to have been DNR’d to death.